Funk Zone Art Walk – Green House Studio. We are so excited to start off spring with a neighborhood art extravaganza to end all wintertime blues. It’s the Second Saturday of the month, and time for the Funk Zone Art Walk. 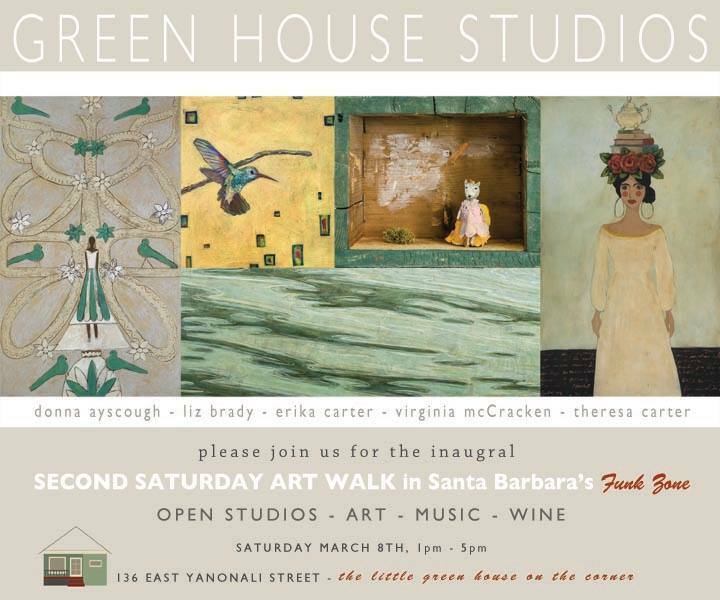 Green House Studios is a working studio for 4 local artists, Erika Carter, Donna Ayscough, Liz Brady, and Virginia McCracken. It is located at 136 East Yanonali at the corner of Santa Barbara Street. The little green cottage is surrounded by a lovely garden full of fruit trees. The artists will open their doors for visitors as a part 2nd Saturdays in the Funk Zone beginning March 8th from 1 to 5:00. They have invited guest artist, Terry Carter to join them in sharing her work during this first 2nd Saturday. ← Funk Zone Art Walk – 2nd Saturdays.